Want to build a robot? Join the club. Want to improve the way we build robots? Join Willow Garage. This silicon valley based robotics company is not just designing robots, they’re working on how we design robots by building a programming language and a standard research bot. Best of all, their software is open source – able to be viewed by its users so that they can understand and upgrade it as needed. Imagine a future where each robotics developer can share hardware and software components with each other in a modular fashion. You could just build a robot like a plug and play computer. With open source techniques Willow Garage hopes to expand the boundaries of robotics, both in research laboratories and in our daily lives. That wall outlet looks tasty...think I'll try it out. And they’ve done a pretty amazing job so far. A few weeks ago they achieved their second major milestone: getting a robot to navigate it’s way around their labs, identifying and plugging itself into electrical outlets. Yep, plug a robot in and you’ve fed it for a day. Teach it how to plug itself in and you’ve fed it forever. 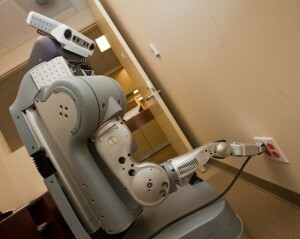 The Personal Robot mark 2 (PR2) wandered around the labs, opening doors, and plugging in to 9 different outlets and identifying one that was unreachable. Check out the video after the break. What was their first milestone? Getting the robot to move around the lab without breaking everything. Not a simple goal. As some of you already know, getting a robot to navigate a course, and to plug itself in, aren’t new accomplishments. What is remarkable is the autonomy, judgment, and persistence of the bot. The PR2 took minutes for it to plug itself in, but it got there with reliability. That’s part of the whole philosophy for Willow Garage: they’re not making perfect robots, they’re making it easier to perfect robotics. After peering in their source code, pouring over their website, and watching their many videos, I’m starting to become a believer in Willow Garage. It’s hard not to when you look at their line-up. Steve Hassan, a Google guru, founded and funded the company. Along with Steve Cousins, the CEO, they’ve attracted enough money to run things the way they want. No military uses, and a big focus on developing better practices and community, not profits. While you or I may look at the PR2 and see a bot, Willow Garage sees a development platform. The ultimate idea is to make copies available to every academic institute that wants to build a reputable robotics lab. The PR2 is being geared up to become a universal research bot, custom fit for robotics software R&D and able to be adapted to whatever investigation scientific minds want to point it towards. Great…but why would you want to choose this robot over any other? The arms aren’t the only sensitive aspects of PR2. It has a great sensor array for a head. The six lens system that will make it into the final PR2 models was just recently unveiled in the past week, so take a good look. The design is apparently a nod to the mini-cooper headlight assembly. Using this sensor array, Willow Garage hopes the PR2 will be able to support a wide-array of 3D object recognition and human-robot interaction. Throw in two-guiding lasers, and a couple of cameras on the arms, and the PR2 is likely to be one of the more observant bots you’ll ever run into. Getting Deja' vu? PR2 and Mini Cooper share style. Not satisfied with building a kickass research bot, Willow Garage is developing the Robot Operating System (ROS), which is open source. There are even higher-level ROS programs utilizing open source software packages for programming PR2 and similar robots. These programs and software packages will jump-start researchers at other institutes as they prepare the PR2 (or other bots) for actual robotics experiments. Lest you think their support of open source code is insincere, Willow Garage is promoting other people’s code as well. Open Source Computer Vision (Open CV), Teleo-Reactive Executive (TREX), and Player are all touted on the Willow Garage website and utilized in the various projects of the company. One of their senior scientists, Gary Bradski, is neck deep in open source society (he just finished a book on Open CV). And Willow Garage is actively pursuing feedback from users and help in further developing the open robotics software platform. Follow some links on their website and you’ll soon be diving headfirst into their ROS code. It’s out there, just waiting for you to see. All of which convinces me that they are walking the walk as well as talking the open source talk. What’s next on the Willow Garage agenda? Just about everything. WG just finished integrating one of their command toolkits (the Orocos RTT) with their ROS code, allowing a whole host of fancy arm movements to sync perfectly with the larger ROS framework. It’s also a good sign that other software packages will be able to be amended into ROS as they are developed. And Willow Garage is aiming to develop some great pieces of software. In their upcoming docket they have 3D locating and positioning tools, object recognition code, human identification and locating software, and a wide array of arm controls. With these pieces of the puzzle, PR2 should eventually be able to find its way around crowded rooms with heavy traffic, plugging itself in or just fetching a cup of coffee for a tired programmer. Willow Garage hopes to use open source code to help improve how robots perceive humans. So the only question left in my mind is, do good people make good bots? I mean, these guys are really focused on the greater benefit of robotics as a whole, not just themselves. And they’ve made good progress, PR2 is hitting a milestone about every six months, and software is developing even faster. Yet, while I’m seeing some amazing new mindsets and techniques, I’m not floored by the results. ROS and PR2 are great, but they’re on par with other groups Singularity Hub has discussed, like CSAIL and Honda. It’s still too early to tell if Willow Garage’s open approach to robotics is the wave of the future, or just a great socially conscious experiment.